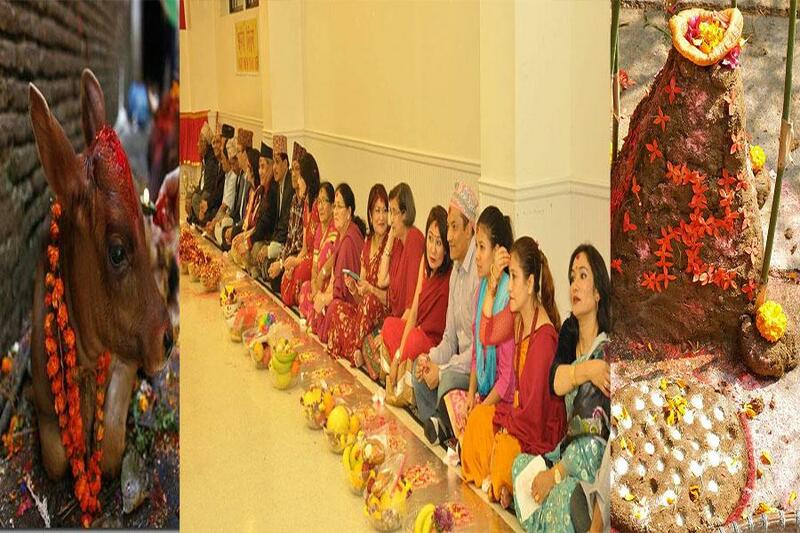 KATHMANDU, Nov 08: Goru Puja or ox worship and Govardan Puja are being observed throughout the country today on the fourth day of the five-day-long Tihar festival celebrated by the Hindus in the country. The Govardhan Puja rituals are being observed today with the replicas of the Govardhan Mountain made out of the cow dung. People prepare a mixture of the cow dung and ochre formed into a paste and apply on the courtyard of their homes and on the floors today. The rituals are linked to the Hindu God Sri Krishna who, according to the legend, lifted the Govardhan Mountain by his hand and protected the people of a place called Gokul from torrential rains caused by Indra, the God of rain. It is believed that the rain God was angered and thereby caused the heavy downpour. Similarly, the ox is also worshipped today as it is a very useful animal in different agricultural works in Nepal which is a predominantly agricultural society. Similarly, Mha Puja is celebrated on the fourth day of Tihar by Newar Community.